This is a wonderful almost do ahead breakfast. Great for company or Christmas morning. Melt margarine and place in the bottom of 9" by 13" baking pan. Spread potatoes (still frozen is okay) in bottom of the pan. Sprinkle chopped vegetables over potatoes. Sprinkle meat over potatoes and vegetables. Note: At this point you may continue or casserole may be refrigerated overnight. Pour beaten eggs over potatoes. Remove from oven and sprinkle cheese evenly over top. 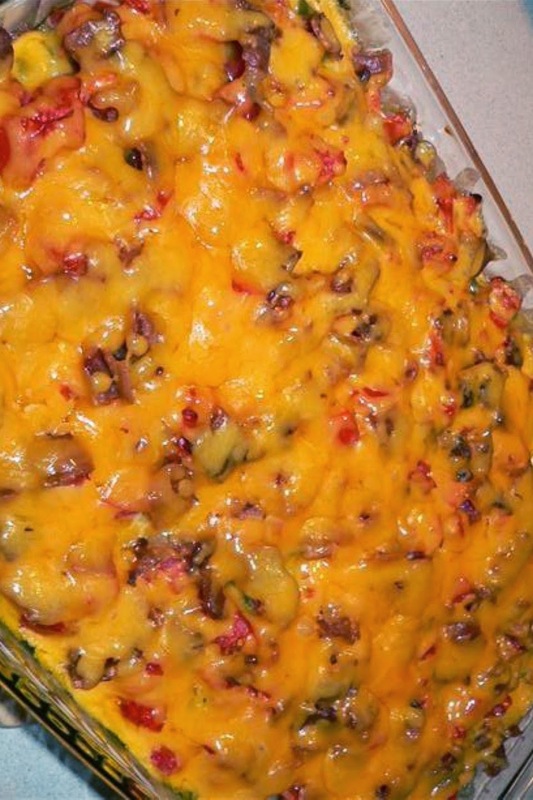 Bake another 5-10 minutes or until cheese is hot and bubbly. Remove from oven and let set for approximately 5 minutes. Cut into 2.5"-3" squares and serve with a spatula. Enjoy.